Historical: Late production was fitted with a closed cab, split at the waistline and two-piece wheels with 10.50 - 16 tyres. Early production had open cab and civilian-type wheel, twinned at the rear. The body was produced in both timber and steel patterns. Almost 17.000 produced from 1939 to 1945. Length: 6.37 m (248 inches). Width: 2.28 m (89 inches). Height: 3.09 m (120 inches). Weight: 6.615 kg (14.553 lb.). Engine: Own 6-cylinder Austin, 3.462 cm3 (211 cubic inches) displacement. 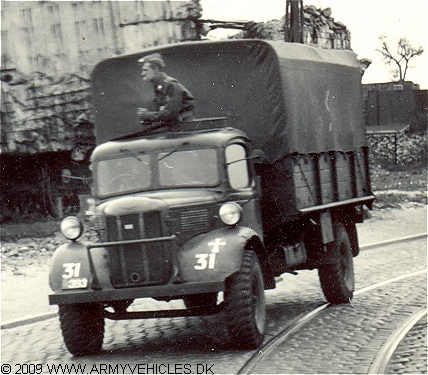 Fuel capacity: 145 liter (32 gallons). Range: 450 km (280 miles).